There was glory for Spalding United on a dramatic afternoon of FA Cup football today (August 25). 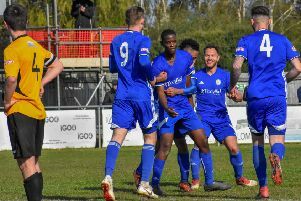 While the Tulips were winning, Stamford and Peterborough Sports, who played each other, Wisbech and Deeping were all drawing while Yaxley were losing a remarkable 12-goal game. Action from today's big FA Cup local derby between Stamford and Peterborough Sports. Picture: James Richardson. The Tulips came through their home preliminary round tie 3-2 thanks to two late goals against Wellingborough Town. Leon Mettam gave them an early lead but the Doughboys hit back to lead 2-1 just after half-time. Then Gary King levelled matters with a goal on 85 minutes before Danny Brooks slotted home the winner from the penalty spot three minutes later. In the big local derby at the Zeeco Stadium between Stamford and Peterborough Sports it finished 1-1 and they face a replay at PSL on Tuesday September 4. More action from today's big FA Cup local derby between Stamford and Peterborough Sports. Picture: James Richardson. Stamford hit the front in the 56th minute when Eliot Putman scored from the penalty spot after Mitchell Griffiths had fouled Bradley Fortnam-Tomlinson in the box and then in the 76th minute Stuart Wall rose highest from a free-kick to head home the equaliser. Chances had been in short supply in the opening period with Putman testing Lewis Moat from a free-kick while both Jordon Cooke and Chris Salt produced a couple of crucial blocks to deny Sports striker Mark Jones. Moat was the busier of the two keepers after the break with a fine stop to deny Rob Morgan while Griffiths produced a cracking headed goal-line clearance to deny Jake Duffy. Wisbech and Deeping also face replays on September 4. Wisbech drew 1-1 at Northampton Sileby Rangers while Deeping shared the spoils at 1-1 as well with AFC Rushden & Diamonds. Scott Mooney had fired Deeping ahead on 16 minutes. Deeping’s Jason Kilbride suffered a broken leg after a tackle in the 29th minute. Yaxley lost 7-5 at Daventry Town after trailing 7-1 at one stage. Phil Stebbing scored their first goal on 17 minutes but then Daventry went to town before Jack Saunders (66 mins), Matt Sparrow (72mins) and Dan Cotton (82 & 90mins) restored some respectability to the scoreline.